Samsung dominates the North American market for Android phones, but its Windows laptops are relatively obscure. Samsung doesn’t go out of its way to fight that. Head to Samsung.com right now and just try to find mention of laptops amid the promos for tablets, phones, and TVs. It takes some digging. But that doesn’t mean Samsung isn’t trying. Indeed, the company has a whole range of Notebook 9 laptops out right now. Earlier this year we reviewed Samsung’s Notebook 9 Pro, a $1,500 PC trying (and mostly failing) to compete with the Dell XPS 15 and Asus ZenBook UX501. Only one word separates the Notebook 9 from the Pro, but it’s in fact an entirely different, $1,200 laptop, going after an entirely different market – thin, large-screen notebooks like the LG Gram 15 and Dell’s entry-level version of the XPS 15. Weighing in at just 2.9 pounds, the notebook packs in a dual-core 6th generation Intel Core i7 processor clocked at 2.5GHz, 8GB of DDR3 memory, and a 256GB solid state drive. It’s a decent collection of parts, but does this incarnation of the Samsung Notebook 9 compete well with similarly priced laptops? And if so, will it be enough to bring Samsung into the mainstream? It’s hard to make a 15-inch laptop feel reasonably sized, while also balancing form and function. We think the Samsung Notebook 9 pulls that off. Part of it is the weight, which comes to only 2.9 pounds. Part of it is the thickness — only 0.57 inches while closed. But what really makes this laptop work, despite its potentially unwieldy 15-inch display, is a straight-forward chassis that gets the details right. The screen’s bezel is only a quarter of an inch thick on the sides, which helps a 15-inch screen fit in a laptop that’s only 13.64 inches wide. That’s actually a bit narrower than the Dell XPS 15, and certainly narrower than a typical 15-inch laptop. Magnesium-alloy is the material of choice. It feels solid, meaning the case does not flex, while also managing to be lightweight. Even the backing behind the display resists flex. The hinge opens and closes smoothly, without wobbling upon release. The Samsung Notebook 9 also feels balanced — sitting on your lap, it stays where you want it. It’s easy to take these things for granted, but so many laptop makers get one or more wrong. It’s nice to see everything come together here. There’s no number pad on the Samsung 9, which gives the keys some room to breathe. Anyone with large hands will appreciate not having to crowd her fingers. The keys themselves feel fine, if not extraordinary. They’re smooth, responsive, and relatively quiet, but don’t offer a lot in the way of tactile feedback. Except, for some reason, the arrow keys: Those four are quite clicky, louder than the rest of the keyboard. The top row of keys function as the F keys by default, but they can be mapped to other functions using the “Fn Lock” key to their right. This gives you quick access to standard things, like the volume and brightness, and a few non-standard things, such as a key that makes the current window transparent. Or even weirder — a key that flips the display upside-down. We suspect this will end up confusing a few users, prompting phone calls to tech support and/or grandchildren. While the keyboard is mixed, the touchpad is an unambiguous plus. It recognizes gestures without fail and is big enough to be accurate. We enjoyed the texture, which is smooth without being frictionless. And at 4.25 by 3 inches, there’s plenty of room to work with. The Samsung Notebook 9 offers two USB 3.0 ports, along with a USB Type-C port. All of these are capable of charging your mobile devices even when the laptop is asleep, which could free up some plugs at your desk. For connecting external displays, you’ve got two options: an HDMI port and a DisplayPort. For audio, there’s a standard headphone jack. An Intel 8260D2W wireless card provides both Bluetooth 4.1, and 802.11ac wireless Internet. There’s no built-in wired connectivity, but an included USB-C to Ethernet adapter gives you gigabit speeds when necessary. The Notebook 9’s 15-inch display offers 1,920 × 1,080, or full HD, resolution. That’s a pixel density of 147 pixels per inch, which isn’t high but is more than respectable. The maximum brightness, our tests showed, is 356 lux. That’s above average, and means you won’t have problems using the laptop near a window on a sunny day. 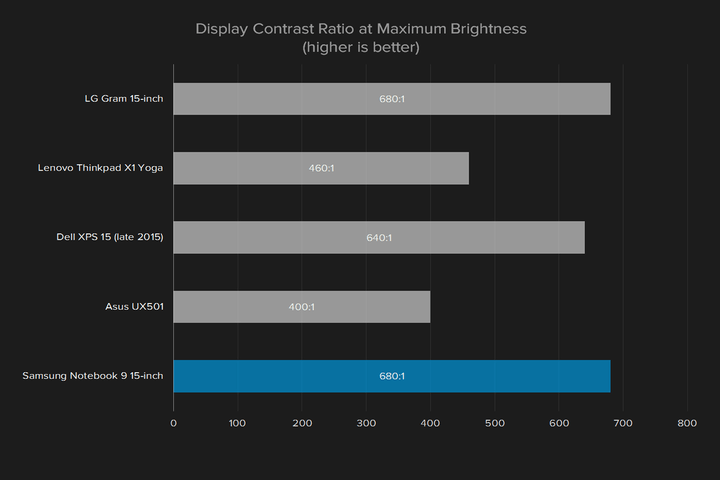 The contrast at max brightness is also pretty good, at 680:1. This handily beats out similarly priced laptops like the Lenovo Thinkpad X1 Yoga, which offered a ratio of 460:1, and even edges out the highly-rated Dell XPS 15 (2015)‘s 640:1 rating. If brightness and contrast are a strength of this display, color is a potential weakness. The display gamut percentage of AdobeRGB standard is 69 percent, which just barely edges out the LG Gram 15 but otherwise falls short of the competition. Scores in the 70s are common, and exceptional laptops rate in the high 90s. The Dell XPS 15, for example, offers a nearly perfect 98 percent. Despite these numbers, we found the display attractive for everyday use. It’s easy to make out the darker gears and springs in this charming little music video, and the colors looked great to us as well. But numbers don’t lie, and designers who depend on color accuracy might not be as impressed as we were. The speakers are perfectly placed on this laptop, on the bottom and toward the front. Assuming you’ve placed it on a solid surface, everything sounds crisp and clear. You can rock out to music from across the room, and even make out the bass pretty well, but as with all laptops, external speakers are recommended for serious listening sessions. The Samsung Notebook 9 15-inch laptop sports a dual-core 6th generation Intel Core i7, clocked at 2.5GHz. Because it’s a current-generation i7, it’s fairly powerful, but because it’s a dual-core processor in a world where most premium 15-inchers have a quad, it’s at a disadvantage. Our Geekbench test showed this clearly. The single-core score was 3,195, which is roughly in line with the competition. The multi-core score of 6,711, however, is around half that of competitors like the Dell XPS 15 and the Asus Zenbook Pro UX501VW. Because those computers sport a quad-core processor, the math is simple. Four cores are more than two. Users are unlikely to notice this shortcoming during day-to-day computing. Web browsing, writing, and image editing were all smooth and fast in our tests, but processor intensive tasks suffered. Our 7-Zip benchmark, which tests compressing and uncompressing files, gave us an 8,855 result compared to the Dell XPS 15’s score of 18,949. Dual-core i7 processors aren’t uncommon among ultrabooks. The LG Gram 15-inch and the Lenovo Thinkpad X1 Yoga both use them, for example. Less power helps keep these thin laptops cool, and the battery lasting longer. They’re fast enough for day-to-day use, but users craving processing power for a few specific tasks should look elsewhere. This laptop uses a Samsung MZNLN256HCHP-000 solid state drive, with 256GB of storage space. 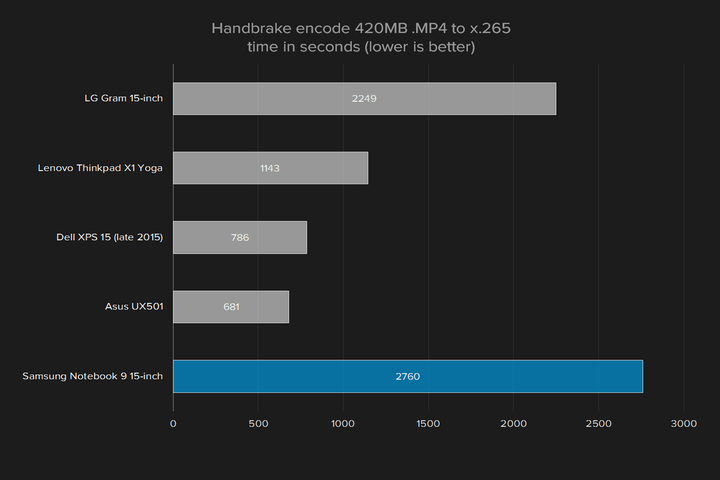 Solid state drives are fast, but not all SSDs are created equal. How fast is this one? Good, but not great. Our CrystalDiskMark benchmark showed a read speed of 489 megabytes per second and a write speed of 306MB/s. The read speed is typical for a SATA SSD, while the write speed is a little slow compared to similar drives. Both speeds are slow compared to computers that take advantage of PCIe connections, which are faster overall than SATA drives. The Asus UX501, for example, offers read speeds of 1,535MB/s and write speeds of 1,572MB/s, which is over three times as fast. 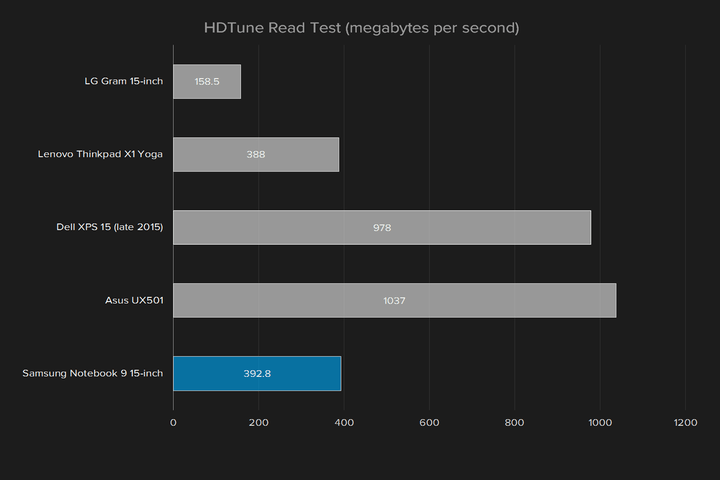 HD Tune, the second benchmark we ran, showed a read speed of 392MB/s. That’s normal, given the other data points we have, and means that longer file transfers won’t slow down transfers. We’re not saying this is a bad drive – but it’s not cutting edge. Because of that, it doesn’t compare well to some of the laptops like the Asus ZenBook UX501 and Dell XPS 15. The Notebook 9 15-inch features on-board graphics, specially Intel’s HD Graphics 520. Without a dedicated graphics card, users should not expect a gaming powerhouse, as our graphics benchmarks make clear. 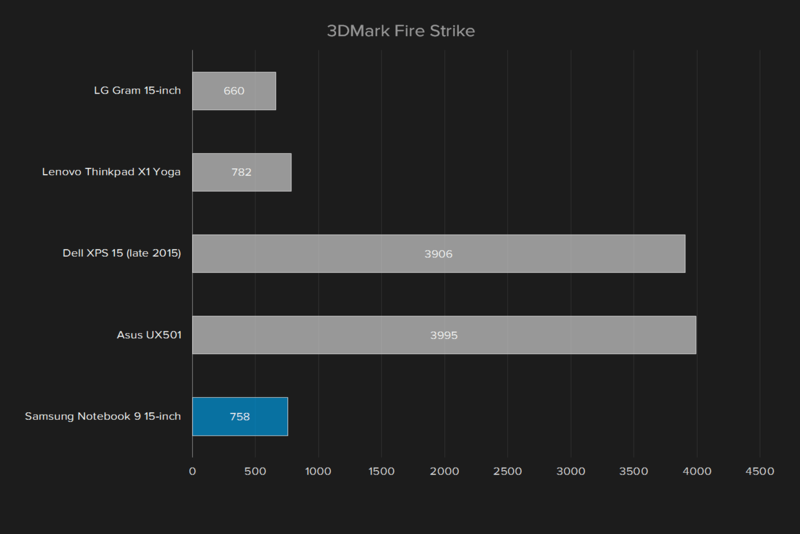 The 3DMark Fire Strike benchmark gave us a score of 758. That compares well to the graphics-deprived LG Gram 15-inch, but is otherwise low. The Dell XPS 15, for example, scored 3,906, as we tested it with optional GTX 960 hardware. Actually firing up a few games confirmed our tests were right. Heroes Of The Storm at its lowest settings gave us a framerate of 55 frames per second, which while not great is mostly playable. At the highest setting, we saw a framerate of 17 FPS, which is basically unplayable. Counterstrike: Global Offensive was worse. At the lowest settings, the average framerate was 43 frames per second, which isn’t great for fast-paced title. At the highest settings we saw 18 FPS, which is slow enough to guarantee you’ll be the first to die in every match. Though this isn’t the lightest 15-inch laptop we’ve seen — that honor goes to the LG Gram 15, at 2.2 pounds — the Samsung Notebook 9 15-inch is light enough that you won’t notice you’re carrying it in a typical laptop bag. So, you can carry this laptop anywhere. But will the battery last? Samsung advertises a whopping 12 hours of battery life from the four cell, 39 watt-hour battery in this laptop. Our results were quite different. Our Peacekeeper battery test, which runs a series of browser benchmarks until the battery dies, saw four hours and eight minutes of battery life. Our web browsing loop, which loads a series of websites in succession, saw four hours and 38 minutes. And our video loop, which plays an HD video until the computer powers off, gave us five hours and 53 minutes. These aren’t bad results. While the video loop is below average, the rest are typical for laptops at this price point. But it’s a long ways from the advertised 12 hours of battery life. Those results apparently came using MobileMark 2007, an ancient battery benchmark that’s no longer supported by the company that made it. This laptop has two fans on the back of the case, and we heard them while gaming or running processor intensive benchmarks. They’re not overwhelming, however. The loudest we could record was 40 decibels, just barely over the ambient noise of our office. Heat also doesn’t seem to be much of a problem. The warmest surface temperature we recorded was 96 degrees, suggesting that the choice of processor and cooling design is working well in this thin laptop. Samsung offers a one year warranty for the Notebook 9, which is standard for laptops. Samsung more than overcomes its price point, beating out the $1500 LG Gram 15-inch in almost every way, and competing well with the $1,650 Lenovo Thinkpad X1 Yoga. With this in mind, Samsung’s 15-inch Notebook 9 is well worth considering. The case is beautiful, lightweight and sturdy. The display offers great contrast, if limited color accuracy. And its performance is great for day-to-day tasks, even if the dual core i7 is limited for processor-intensive ones. All this weighs in at 2.9 pounds, making it one of the more portable 15-inch laptops on the market right now, without compromising too much on power. This is not the best laptop money can buy, but for $1,200 it’s very good. The Samsung Notebook 9 15-inch could build Samsung’s reputation in a crowded PC market.